Wookiee The Chew belonged to Chrisolo Robin and Chrisolo Robin belonged to him… In a world where AT-AT’s lose their tails and bobaberries are ripe for the picking, join the adventures of the biped of very little brain. 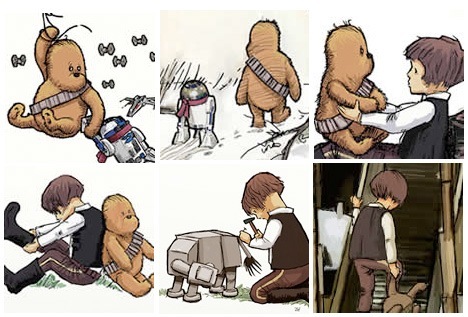 Wookiee The Chew’, in the style of the original Pooh books. 24 pages of affectionately crafted adventure, brand new b&w illustrations and sneaky Star Wars references- a tribute to the combined genius of George Lucas, A.A.Milne and E.H.Sheppard. Suitable for jedi apprentices of all ages!